Buy Thai Baht in India The Easy Way! How To Buy Thai Baht in India? Being a Forex marketplace, every money changer competes with others. They will always offer you the best exchange rate, so that they get your order. Be guaranteed to get the best Thai Baht buying rate in your city. We charge absolutely zero commission on every transaction. No hidden charges either! Pay directly to the chosen money changer and receive Thai Baht Currency/Forex card along with the invoice. 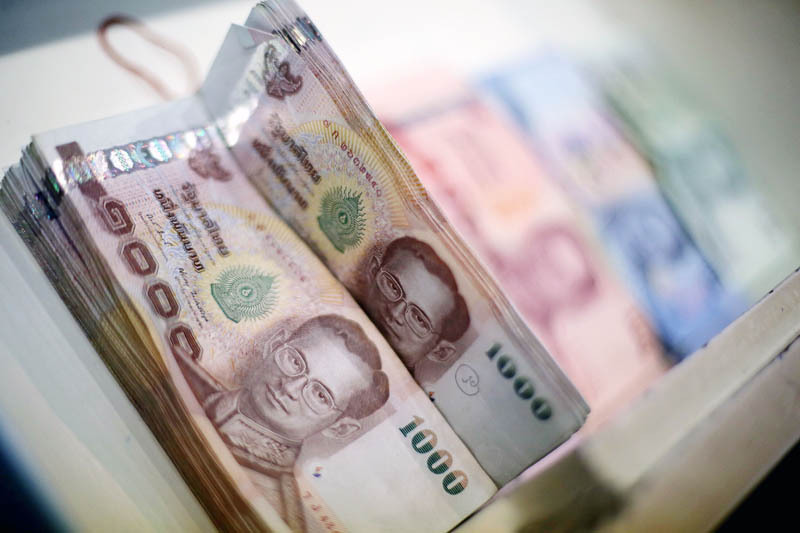 Thai Baht rates can fluctuate dramatically. When you buy Thai Baht Online via Extravelmoney, you can observe and lock the rate when it is favorable. Just pay a small fully refundable deposit & lock the rate for as much as 2 days! 1. How much INR can I carry to Thailand? You can carry upto INR 25,000 as cash to Thailand from India. As per RBI rules, an Indian resident is allowed to carry up to Rs 25,000 as cash from India to abroad. Please Note : This limit would hardly be enough for your Thai trip. It is recommended that you exchange INR to Thai Baht in India itself before going to Thailand. 2. How much Thai baht can I take to Thailand from India? A resident Indian can take upto USD 3000 or its equivalent in any currency (including Thai baht) as cash and a total of up to USD 10,000 or its equivalent in forex card or traveller’s cheques. 3. Should I exchange money before I travel to Thailand? As per RBI guidelines you’ll only be able to carry maximum INR 25,000 to Thailand. If you are planning to exchange INR 25,000 to Thai Baht after landing in Thailand, it will most probably not be enough to cover the cost of your trip. You’ll get lesser amount of THB after bad exchange rates and high exchange fees in Thailand, as compared to India. So it is better to calculate how much Thai baht you’d need for your trip and exchange INR to THB before you travel to Thailand. 4. What is best currency to take to Thailand? The Thai Baht is the official currency of Thailand and is the best currency to take for your trip to Thailand. In case you are not able to procure Thai baht, you can also carry the US dollar which is globally accepted everywhere. Simply convert your USD to Thai baht at the airport or at currency exchange centers in Thailand. 5. What is the best way to carry money in Thailand? The best way to carry money to Thailand is by carrying the Thai baht currency as cash and in forex card. Calculate the total amount of money required for your trip to Thailand. Exchange INR to THB by keeping 40% of THB as cash and the rest 60% in forex card. Thailand has many ATMs and business establishments usually have PoS machines where you can swipe your forex card to pay for expenses. 6. How much money to take to Thailand for 5 days? If you are planning on getting a Thai visa on arrival, that’ll cost you 2000 Thai baht. As per this post in our blog “10 foreign countries cheaper than travelling within India” an Indian traveller can expect to spend a minimum of about Rs 2000/day on their Thai trip. However, if you are booking high end accommodations and dining from the best restaurants, this cost can easily go up. So on average expect to spend Rs 30,000 - 40,000 (including visa fee) for a 5 day trip to Thailand (excluding flight tickets). 7. Using debit card in Thailand, will it work? Before travelling abroad check if your debit card in enabled for international transactions such as cash withdrawal from ATMs and swiping at PoS machines abroad. This can be done by calling the customer care of the bank which issued your debit card and checking up with them. If it is international transactions enabled, you can use it in Thailand and it will work. The normal debit card charges may come to 3-6% of the amount paid for by using the debit card. Please Note : We recommend using a forex travel card instead of a debit card when going to Thailand. This is because of the benefits of forex card over debit cards such as no currency conversion fee, DCC fee and bad exchange rates of banks. 8. Forex card or cash in Thailand? A combination of both forex card and cash will work best in Thailand. Cash can be used to enjoy the local street food, buying souvenirs, paying for local transport etc whereas forex card can be used to do shopping in malls, airport duty free shops, amusement parks, booking hotel rooms and dining out at high end Thai restaurants. 9. What is the minimum cash required to enter Thailand? 1. Visa on Arrival: Must hold minimum THB 10,000 per passenger or THB 20,000 per family. 2. Tourist Visa holder: Must hold minimum THB 20,000 per passenger or THB 40,000 per family. 3. Transit Visa holder: Must hold minimum THB 10,000 per passenger or THB 20,000 per family. 4. Non Immigrant Visa holder: Must hold minimum THB 20,000 per passenger or THB 40,000 per family. 10. What are the documents required for buying Thai Baht? 11. How many days will it take to deliver the currency? When you are buying Thai baht from ExTravelMoney as either cash or forex card, it’ll be delivered within the same day you place the order. Please Note : The forex market works till only 5:30 p.m. Please make sure to place the order before 12 in the morning. Your product (Cash, Forex card) will be ready to be collected (visit store) or delivered (home delivery) before 5:30 p.m.